I love Brussels sprouts. We've been eating Brussels sprouts in abundance this winter. I have a few recipes that I love: this one using just the leaves is wonderful. I also love shredding them in the Cuisinart, sautéing them quickly in olive oil and garlic, removing them from the heat, squeezing half a lime on them and shaving Parmesan on the top. Just thinking about it makes me hungry! The fastest, simplest way to prepare them is to trim the brown ends off, cut them in half and then saute them in a cat-iron skillet to really get them to develop wonderful color and flavor. I like to render some thick-cut slab bacon in the pan first to add flavor and kick it up with some crushed red pepper. Last weekend, I made them for my sister-in-law, who is not a huge fan of greens - I think they passed the test. My camera is having some problems and is in the shop. I feel completely naked without it and rented a replacement until my baby is fixed. I decided to treat myself and rent a better camera than my usual one: this is so much fun! Can you notice a difference? I feel like I can, but maybe it's just my imagination! I'm looking forward to wandering around snowy New York this weekend and clicking away. It's all mine until Monday morning! Heat oil in a cast-iron skillet over medium-low heat. Sauté bacon until fat renders. Add sprouts, toss them to ensure they are well coated in the bacon fat and oil, season very generously with salt and sauté (turning them only occasionally so they brown nicely), until fork-tender. If they brown more than you would like before tender, simply add a few Tbs of water or chicken stock, cover and allow to steam until tender. Enjoy! By the way, I couldn't resist picking up persimmons in the store today. I am really not sure what to do with them, although my first thought was jam? What would you do? Your photos are always so lovely that it doesn't matter what camera you use! We're big Brussels sprouts fans here too. I also love to pan fry or roast them with bacon. Wish I could help with the persimmons. I rarely find edible ones here, so I don't use them much. When I do find a nice ripe one, I just eat it! I really like your idea to sauté them in olive oil and garlic with Parmesan on the top, how delicious! I'm curious to know which camera you rented and what you think the differences are with your own. 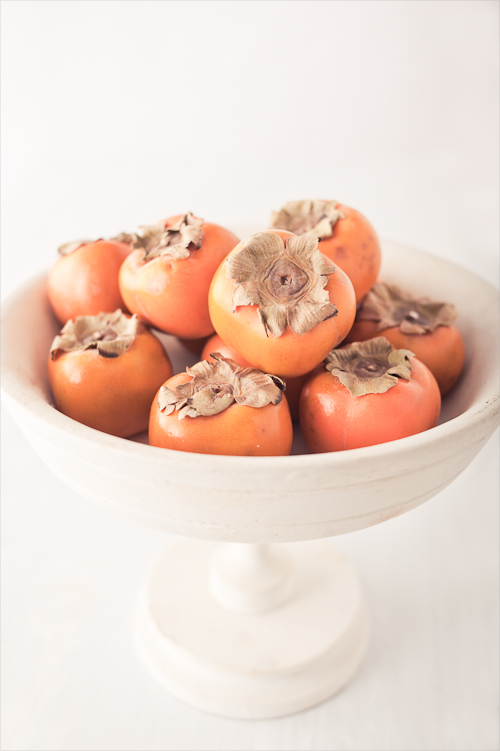 As for the persimmons, jam sounds lovely or how about persimmon cookies? As for persimmons, you might try letting them get really ripe and using them in a quick bread with some cranberries. Also have had a persimmon cake that a friend made but have never tried that myself. Happy winter! Keep up the lovely work. What kind of camera are you renting? Brussels sprouts are fantastic! I love your photos! I love when I see a delicious recipe and have all the ingredients in my fridge! This is going to be on my plate for dinner tonight - thanks for sharing! Your recipe & great photos made me so hungry for those little green devils that I had to hit the grocery and get me some. After processing and getting them into my skillet with olive oil and garlic I had a feast! Thanks. The camera I'm renting is the Nikon D3 which is older than mine but marginally better - what I notice in particular is a little better tonality and clarity in the images. But I adore my camera and it's much lighter than this one which is a definite plus. I would have loved to try the D3x which is newer and is definitely quite a bit better than mine but it was more expensive to rent. Maybe next time! Lime. What a great idea!! 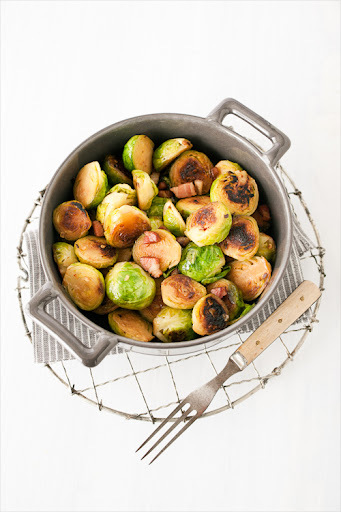 As I look at the pot of Brussels sprouts with slab bacon, I am hungry again. I just ate my lunch and I have been always thinking of bacon. Thanks for this wonderful recipe. I do love sprouts. these look very tasteful, but i have one question: i'm alergic to bacon and all pork processed food, do you have any tip to substitute the bacon for anything else? If that photo doesn't make someone want to try sprouts, nothing could. Perfect. Just this week I discovered how wonderful the flavour of persimmon goes very well with my granola! It is such a pleasure! I can't say I like brussel sprouts, but I sure do like your blog! Hello! First I want to tell you how very sorry I am that you lost someone you loved so much! I know what it is like many times over. I would like to ask a question please. Could you tell me where you got your measuring beaker?